FO: Sockettes | Stitch, Brinn, Stitch! Anyway, yes I’ve been doing some knitting, as I mentioned. I started a small project to have on me and I finished it up in just a couple of days. Pattern: I made them up as I went. The second is better fitting that the first. They’re toe up and a short row heel. Yarn: The Sanguine Gryphon Bugga! left over from a batch of WWFY knitting. Needles: US 1, the same sock needles I use for all socks. Like I said, the second one fits way better than the first, which is a touch too long and a touch too wide–I accidentally did too many toe increases. I’m pretty happy with the fit, though I did have to sew the ends of the back of the heel to the border on the foot so they’d be tight enough. I’m not really sure how to remedy that without the sewing. I wanted to do a flap/gusset heel but I also was feeling iffy about the stripes (I had very little of the green to work with, so that’s why they don’t match) and I like toe up socks, so I just did them that way. 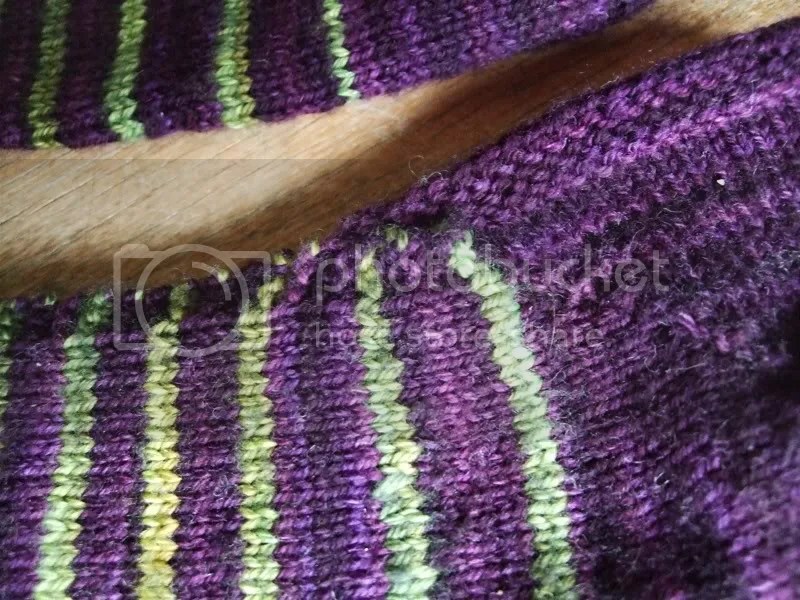 I think this sort of sock is a great way to use up sock yarn scraps (and in fact, I’m planning another pair from the remainder of the Manly Aran socks) as well as being very functional–I wear open topped flats a lot and my commercially knit socks for them are wearing a bit thin. Plus I only have like, three pairs anyway. Since finishing these, I’ve started working on a shorter version off my Leah vest to work out the shaping (and cause I wanted a shorter one). I’m using Reynold’s Tiara, a rayon/silk blend I’ve had in my stash basically since I learned to crochet (I got it at a yard sale). Glad to have a purpose for it (or some of it at least). But more on that later. Interesting. I’m still not entirely clear on the construction. How did you make them open topped? I don’t wear flats mostly because sockettes tend to pop off my long and thin feet. Also flat shoes make my feet hurt. As do high heels. Combat boots and sneakers are the only shoes that don’t tend to hurt my feets. Basically, you knit a sock toe, decrease/cast off, then knit back and forth along the bottom of the foot, then knit the heel. I like that they’re custom-sized. Also, I wear a lot of flats.